The Allegheny Health Network (AHN) is a proud member of Highmark Health. Working as an integrated delivery system, AHN leads the region in the future of care delivery. Our clinical footprint includes two quaternary hospitals, five community hospitals, four health + wellness pavilions, and hundreds of primary and specialty care offices, with more than 1,700 physicians, 17,000 employees, and 2,000 volunteers. AHN, consistently ranked as a national leader in the healthcare industry, is committed to improving health and promoting wellness in our community, one person at a time. We are dedicated to continually learning and exploring new, better, and creative ways to serve our patients, our employees and our community. The Allegheny Health Network (AHN) Research Institute brings ground-breaking scientific discovery from bench top to bedside. 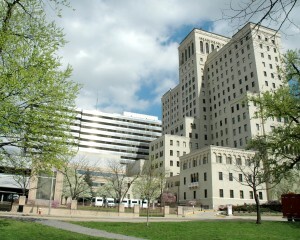 As the research arm of the Pittsburgh-based Allegheny Health Network, we offer novel drug therapies, revolutionize surgical procedures, and lessen the impact of chronic disease, while partnering with our patients and their families, physician scientists, industry, pharma, and health systems across the Nation to work hand-in-hand with one goal in mind: improve the science of medicine. Primarily serving the regions of Western Pennsylvania, Eastern Ohio, and Northern West Virginia, the AHN Research Institute offers patients more than 500 clinical trials including biospecimen and data registries, medical device trials, and more than 250 therapeutic clinical trials. Our current research portfolio represents work on-going in the basic sciences and preclinical areas, translational research, and clinical research – with a balance of grant-funded projects, investigator-initiated research, and sponsored projects. Allegheny Health Network: Health for All.